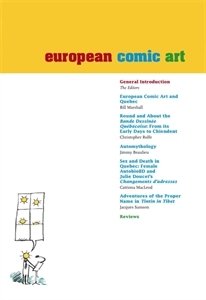 European Comic Art is the first English-language scholarly publication devoted to the study of European-language graphic novels, comic strips, comic books and caricature. Published in association with the American Bande Dessinée Society and the International Bande Dessinée Society, European Comic Art builds on existing scholarship in French-language comic art and is able to draw on the scholarly activities undertaken by both organisations. However, our editorial board and consultative committee bring expertise on a wider European area of comic art production and the journal will emphasise coverage of work from across Europe, including Eastern Europe.Published twice a year, European Comic Art is available in both print and online form and serves as a forum where different theoretical and critical approaches, as well as national comics traditions, can meet. Please note that this journal is available in online only format - click here for details.